Benito Huerta has been part of the Texas art scene for more than four decades, advancing Hispanic Art not just through his work, but as a curator and educator as well. In paintings, drawings and prints, he returns time and again to familiar themes and archetypes inspired by his Hispanic roots, art history background and contemporary culture and politics. Huerta’s paintings are bold and vibrant in contrast to the more intimate paintings of his partner, Janet Chaffee. Using encaustic, oil, ink, and other materials — often seemingly floating on mylar — Chaffee creates paintings that reference the natural world. “Over the Pass” may have been inspired by the patterns in a butterfly’s wing, the petals of a flower or the segmented body of an insect. In “Hess CaC03 (Calcium Carbonate),” she uses encaustic, dry pigment and oil on panel in a process that produces a textured, tactile surface. Some pieces contain circular forms that resemble cells or other molecular structures. “In-Kah-Pah” suggests rocks that have been smoothed and rounded by running water. Chaffee’s deep connection with nature extends to her materials, as the beeswax, minerals and mica she often uses are naturally sourced. Huerta has always blended high art and pop culture, drawing on cultural icons and imagery to create distinctive archetypes that he continually revisits. In the large diptych, “Exile off Main Street,” Huerta employs oil on black velvet for the left panel and tar on plywood for the right. Using Picasso’s “Demoiselles d’Avignon” as a structural reference, he substitutes new world imagery, employing a skull, serpent and watermelon, as well as adding wings to one figure and a Mexican wrestling mask to another. The right panel contains his signature arabesque pattern of black lines. 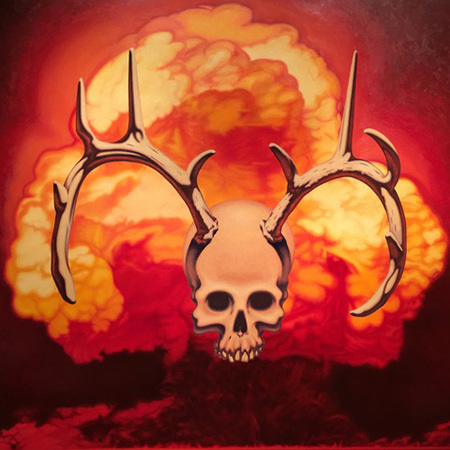 In “Crown of Creation,” a skull with antlers floats against a background depicting a massive nuclear explosion. The piece was influenced by Jefferson Airplane’s 1968 psychedelic album of the same title, the cover of which features a mushroom cloud. Huerta grew up during the Cold War, when school children were subjected to nuclear-attack drills and people built underground shelters. This piece and many others have been influenced by events that touched him personally. Like the artists he admires — Picasso, Jasper Johns, Warhol, among others — Huerta has developed a vocabulary that he re-examines and reworks to produce a powerful body of work that transcends cultural and stylistic boundaries.